I find it incredibly enjoyable, and I find it less stressful, because everyone understands we want to win but history tells you what lays ahead and we're just trying to speed it up. I'm finding it as enjoyable a time as I've experienced in AFL football. 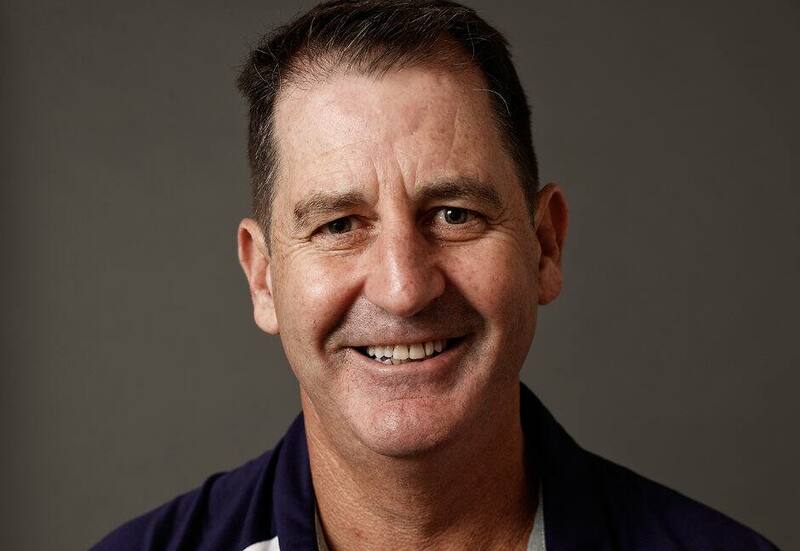 YOU WON'T find a more competitive person in the AFL than Ross Lyon, so many will be surprised to learn that the Fremantle coach is deriving as much enjoyment from the Dockers' rebuild as at any other period in his League career. For the first time, Lyon has been in charge of a club that has missed the finals in successive seasons, but the 51-year-old says the transition to a younger playing list had removed some stress, and he is buoyed by the progress made by the Dockers' developing squad. "Whether I've got the oldest list or the youngest list, coaching is teaching," Lyon told AFL.com.au. "St Kilda had some aging champs going out the door and we had to find the next batch, and there was a lot of training and education in that. And going to Fremantle, I'd argue we had to really educate, including a lot of people who'd been around for a long period of time. "I find it incredibly enjoyable, and I find it less stressful, because everyone understands we want to win but history tells you what lays ahead and we're just trying to speed it up. "I'm finding it as enjoyable a time as I've experienced in AFL football." To add some context, Lyon played for both Fitzroy and the Brisbane Bears and was an assistant coach at Richmond, Carlton and Sydney (which was premier in 2005 and runner-up in 2006) before coaching St Kilda (runner-up in 2009 and 2010) and Fremantle (runner-up in 2013). Lyon is also planning to add some flair to his defensive game-plan and believes the recruitment of former Greater Western Sydney dasher Nathan Wilson will prove a key ingredient. "We just want Nathan to do what he does – run, take it on and kick with penetration – and I think he'll do it really well for us," Lyon said. "We'd like to play with a bit more penetration as a team. We've been a bit stagnant with the ball and we'd like to get away from that and get our backs running and joining in like they did (early last year). "And Nathan should help us in that area." Lyon doesn't yet have an answer to Freo's ruck conundrum, with veteran Aaron Sandilands returning from injury and impressive teenager Sean Darcy (who is recovering from a "significant" calf issue) to vie for the No.1 mantle. "It's a question we've got to work through. We'd like to play both and see how that looks, how it affects everybody, how damaging they can be, or how vulnerable the two big guys make us because (reigning premier) Richmond had Shaun Grigg, so I might have to put Nat Fyfe as a mobile ruck," Lyon said. Fyfe will remain integral to the midfield brigade but is expected to spend more time resting forward than in previous years, in tandem with veteran David Mundy, in an attack in which Lyon has forecast some experimentation. "He's certainly an aerial threat forward and we'd like to increase our capacity in the air in the front half, and both Nathan and David can both play an important role in that," Lyon said. Lyon said the latest additions to the Dockers' midfield, top draftees Andrew Brayshaw (pick No.2) and Adam Cerra (No.5), remain chances to make their AFL debuts in round one given their pre-season work to date. The coach was also excited by the progress of versatile tall Alex Pearce, 22, after missing a season-and-a-half with leg problems. "He can't believe how well he's handling it after such a tough run. He's an important cog in our machine. He's tall, quick, big tank, great leader, tough, and can play either end, so he's been significant for helping us feel good about ourselves," he said.